I have used a custom font in my previous app. But I'm not sure how to load these. But this just falls back to using Helvetica. How can I find what name to use? In the debug output, look for your new font's 'family' and 'font' name. Pass whatever is displayed as the 'font' name corresponding to your new font family (there could be more than one 'font' associated with your new font 'family') to UIFont *myNewFont = [UIFont fontWithName:@"font_name_from_debug_output" size:20] and you should be in business! "Full Name" is what you're looking for. That's what worked for me with TTFs. I just used a font that had a different name from the "Full Name" in Get Info. And search for the correct name of the font you want to use. To use fonts in iOS, you have to load the font based on the font's FULL NAME (PostScript Name), which is sometimes (and usually is) different from the font's actual FILE NAME. Imagine yourself renaming the Font file "Arial-regular.ttf" to be "foo.ttf". 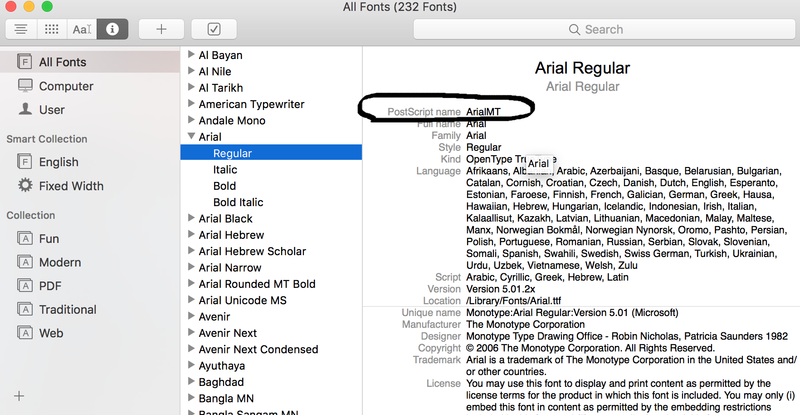 The font contained inside the font file you just renamed is still "Arial-regular". There are some good programmatic ways to get the font name already on this thread, but I have a different approach using the command line. The script above will run through all the .ttf and .otf files in the current directory, then print out the PostScript Name for each font which you can use to reference the font file in XCode or elsewhere. This is a bit faster than copy-pasting code inside of your AppDelegate.m file to print out the names every time you want to add a new font file, which is the popular method, and it's also faster than opening the Font in FontBook to inspect the PostScript Name. USEFUL TIP: If you alias the above script in your terminal so that all you need to do is type a single command to get all the PostScript font names for all the files in the current directory (my function is called fontnames so all I have to do is type fontnames at the terminal inside the directory with fonts in it, and the PostScript names will be printed automatically, then you will save time in your development workflow and have this handy script ready to use when you need it. After you've added your fonts to your project/app, add this code (probably just in app delegate didFinishLaunchingWithOptions method) in order to print out all the available fonts for your app. From with-in that list you should be able to identify the font you're after. Don't forget to remove the unnecessary code after. Replace with your own throwable Error objects as required. You can also use otfinfo --info arial.ttf to get the name from command line. The postscript name is the one you need to pass to the UIFont constructor. Not the answer you're looking for? Browse other questions tagged ios uifont or ask your own question.